The European Commission will present its work programme for Horizon 2020, the EU’s research and innovation programme for the next two years, on Tuesday (13 October). A total of 16 billion euros will be allocated to priorities such as industrial competitiveness, digital agenda, and even migration. 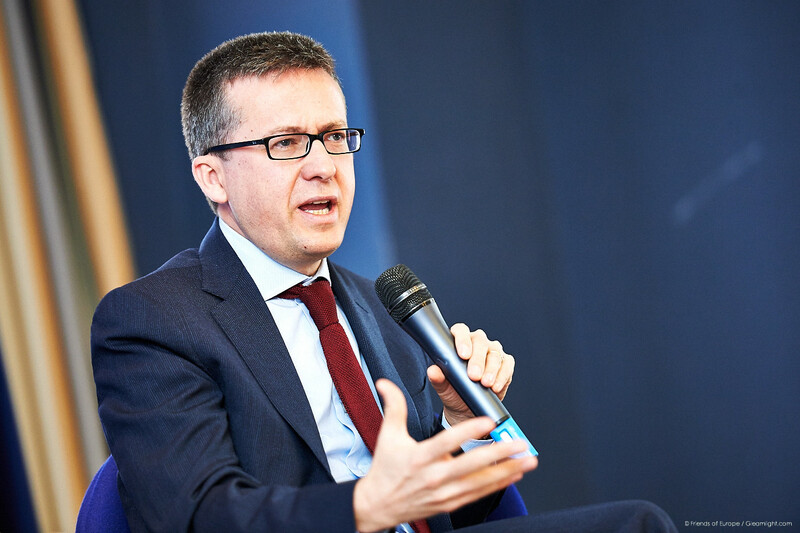 Carlos Moedas is Commissioner for Research, Science and Innovation. Moedas spoke to EURACTIV’s Jorge Valero. Next month, it will be one year since you took office at the European Commission. What will be your leitmotiv for the rest of your mandate? The angle has to be how to get better results out of the taxpayers’ money. The seal of excellence we presented on Monday (12 October) is exactly about that. It is a very small step that can have a huge impact, because for the last 10-15 years, people have talked about how the structural funds should work better with Horizon 2020. And people tried everything, but it didn’t work, to be frank. With this seal, we are giving the political commitment of two Commissioners to break the silos between these two funds. When I took office I said I would try to find pragmatic solutions, simple but that works. In recent months, you have repeated your motto: “Open innovation, open science and open to the world.” What does it imply? It is a statement that should mean, at least in the minds of the Europeans, that if you want to have better science and innovation, you have to be in an open system. In a digital world, you are in a system where you don’t have barriers anymore. If you try to close your country, or apply protectionism, you will have less innovation and science. There are of course pluses and minuses, but the benefits are much bigger for society as a whole. Does the ruling on Safe Harbour go against this openness? As a Commissioner, I will not comment on the Court’s decisions. They should be respected. Openness is also responsibility. Openness does not mean I can do everything I want, but it means more integrity. That is why we have launched the Research Integrity project. Soon we will present a code according to which if you are participating in our programmes, you will have to prove that you don’t cheat, that you don’t commit plagiarism, among other things. Today, we are in the early stages of a world we don’t know yet what will come. It doesn’t mean openness without responsibility or restrictions. People need to know where the data is. We need to feel safe. But at the same time, we should let the data go. A group of member states recently sent a letter calling on you to make all the necessary efforts to push research and innovation higher on the Commission’s agenda for next year, as they feel this field has been neglected for 2016. What is your response? Research and innovation is a priority across the board for this Commission. In each of the Commissions priorities, like the Energy Union or the Digital Single Market, innovation is by definition there. We have to have a way of looking at the Commission’s role which is not only creating pieces of legislation. I understand the ministers´ concerns, and I will talk to them personally, to tell them in terms of the Commission President’s priorities what concrete things we are doing, and their long-lasting effects. But from the very beginning, I was very clear that it was not about more legislation, but better legislation. Last summer you proposed a European Innovation Council, but there is already a similar body: The European Institute of Innovation and Technology (EIT). Is it not redundant? The idea of the European Innovation Council does not have to do anything with the EIT. It is not about creating a new institution, but how can we streamline the instruments we have today in terms of innovation in a one-stop shop. Most of our innovators do not know where to go, due to the variety of instruments to support them, such as the SME instrument, or the fast track innovation. At the same time, it is about how we can have these instruments more ‘bottom up’, which is the Brussels jargon to grant more freedom to people to do what they think it is right. It comes from the model of the European Research Council. I never thought about the EIT as the reference. Is this proposal not a hidden criticism of the EIT? Absolutely not. The EIT is a fantastic project. We are very proud of it. Wouldn’t it be more efficient under your supervision? I will not comment on that. When I took office, I got a mandate to work with everyone to steer innovation, research and science. I have a great collaboration with my colleague (Commissioner for Education and Culture) Tibor Navracsics. This Commission is not about ‘this is mine and this is yours’, we work together. How does the Horizon 2020 work programme for 2016 and 2017 reflect current events such as the migration crisis or long-term priorities such as the transition to Industry 4.0? The point is how to align the Horizon 2020 and the Commission’s priorities, such as boosting growth and competitiveness. Thus, we will have in the next two years €2 billion for SMEs, and the ERC will offer around 1000 grants, worth around €1.7 billion, to support growth-enhancing breakthroughs. In the case of the Digital Single Market, we will support the European Open Science Cloud with €50 million. It is about creating a cloud that offers full service for scientists. We are also allocating €139 million for the Internet of Things and €100 million for digital security, among others. One of the priorities will be improving Europe’s industrial basis. In this area you have the so-called industry 4.0, which is very much related to the Internet of Things, and the development of 5G in the mobile sector, namely machines talking to machines. How are these three things interconnected, and what is your vision in this field? This is the most crucial area for getting it right or wrong for Europe. We have a very good industrial basis, with countries having a very good traditional industry, physical industry. But those countries are not making the merge with the digital world. So the question is how we can get this industrial basis to the next level, which is digital. If we don’t do this, we will be in the middle of the road, because you need speed and scale in the digital world. In the US, you see they are doing very well the digital dimension. They are going from digital to physical, for example in the automotive sector. We have to go from traditional to digital. I think we will meet somewhere in the middle. But we cannot lose this transition. The Internet of Things, industry 4.0 and 5G are all together. The fact is that you really don’t know where you will find the answer. Some options will work and some others not, but you cannot miss that bet on the future. About 400 euros if one uses cheap Chinese components and builds an electromagnetic pulse generator – any ten year old can do this – and blow out every electronic device in a 20 storey office building. For about 60 thousand euros and packed in two suitcases – take out a city the size of Frankfurt. Maybe you might want to rethink digital.